Update, May 1: Sea of Thieves just got a new round of cosmetics. Sea of Thieves at last gets some new cosmetics in this week’s patch, bringing in a few more long-term goals to work toward in your pirate career. Patch 1.0.6 also makes some changes to how customization items are distributed, and makes a handful of much-appreciated quality of life changes as well. Here’s how customisation works in Sea of Thieves. The new customization options adds new clothing, ship looks, and weapons across Executive Admiral, Grand Admiral, Rotten Bilge Rat, Castaway Bilge Rat, Corsair Sea Dog, Ruffian Sea Dog, and Imperial Sovereign categories. There are some neat new options, especially on the clothing side, though some heavy reliance on simple recolours for costly ship items is causing a bit of a stir on Reddit. Stock is also getting distributed regionally now, with different outposts hosting specific item sets, making it a bit more of a trek to finish out your collections. As a celebration of the game’s one month anniversary, you can also grab hold of the Eye of Reach. 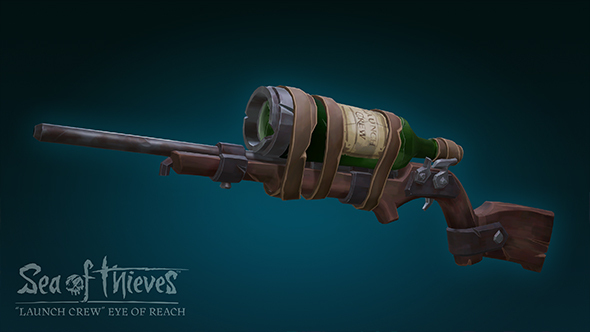 That’s a special rifle with a bottle for a scope, available over the next two weeks for just one gold piece. Skeletons manning cannons are now a bit less accurate at long distances, Merchant voyages can no longer be cheesed into pointing toward a specific outpost, and the bell on the small ship has been moved a bit to keep you from accidentally ringing it. Quite convenient. It’s a minor update, though any fresh content is certainly much appreciated. In the new developer update video above, executive producer Joe Neate says that with basic bug and server fixes out of the way the focus is now squarely on new content with regular updates. A more substantial addition is scheduled to launch later this month, with the Hungering Deep update set to mark the first of the six free major content additions this year. Original story, March 19:Rare have revealed they are working on new cosmetics for Sea of Thieves, including some multicultural pirate styles. During a Reddit AMA with Rare, one redditor asked whether the developers have considered adding other cultures’ pirate styles. It would be interesting to see a wide variety of pirate cultures reflected in Sea of Thieves – after all, piracy dates back to ancient times with the practice taking place all over the world. The stereotypical view we seem to have of piracy is epitomised in the likes of Captain Jack Sparrow, and Blackbeard, but in reality, some of the the history’s most influential pirates were from China, Central Europe, and Scandinavia. Sea of Thieves is due for release on March 20.